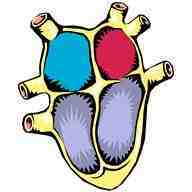 Try our heart quiz to see how well you know you hearts functions and properties. Before you take this test you might want to revise at our Hearts Facts Page. 1. Blood leaves your ____________ in arteries. 3. ____________ is pumped around your body by your heart beat. 4. Your rib cage ____________ your heart. 5. At rest, it takes 6 ____________ for blood to be pumped around your body and back to your heart. 7. The right side of your hear is ____________ than the left side. 8. Blood is returned to your heart in ____________. 9. What does the heart do to blood? 10. What do veins carry back to the heart? 11. The heart is an organ and is also a? 12. Which parts of the heart open and close? 13. What does ' oxygenated' mean? 14. Oxygenated blood comes from the? 15. How many valves are there in the heart? For the answers to 'Your Heart' Quiz click here.